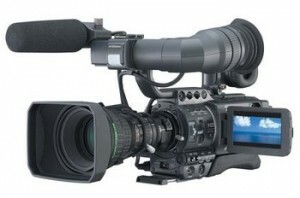 In keeping with our philosophy of never settling for simply being the best, IndyVisual is pleased to announce the recent purchase of new high-definition (HD) equipment that will allow us to become the first wedding videography studio in Indiana to videotape weddings in the spectacular HD format. The end result for the bride and groom is a stunning picture that will allow them to relive every precious detail and emotion of their special day with a clarity unsurpassed by any other studio in the state. 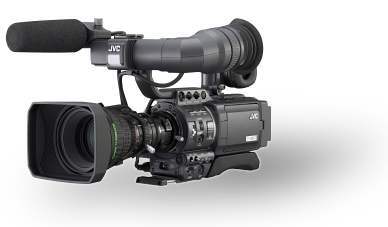 In addition to quadrupling the resolution of the highest-end professional DVCAM cameras (also used only by IndyVisual), our new cameras capture footage in the widescreen 16:9 aspect ratio, providing 33% more picture information to fill every corner of the next generation of widescreen TVs. Also, by acquiring footage at the film industry standard 24 frames/second versus 30 fps for video, we’ve come a huge step closer towards achieving every videographer’s “holy grail” of making video look more like film. Because the options for viewing HD recordings at home remain limited, IndyVisual will provide HD clients with their finished videos on standard DVDs (which will still look crisper than those shot on standard DV tape) until a consumer HD format is more firmly established later in the year, at which time the clients will receive HD versions of their wedding videos. Following a brief promotional period, HD versions of our packages will be available for an additional $1,000, while previously-booked clients may upgrade their packages for $500. Breaking ground is nothing new for IndyVisual. In 1993, we were the first wedding videography studio in the state to videotape weddings with professional broadcast cameras. In 1994, we were the first to utilize non-linear editing equipment, giving us the creative flexibility to develop the “look” that has defined our studio. In 1999, we were the first to provide our clients with their finished videos on DVD. In 2000, we became and remain the only studio to use professional broadcast DVCAM (higher-end DV) cameras to capture footage. Of course, we recognize that it takes much more than fancy equipment to create a wonderful experience for our valued clients. That is why we focus more heavily on promoting our service, experience, relationships and body of work. However, we hope that this technical leap forward reflects our continuing commitment to raising the bar in every aspect of our own business while setting new standards for our industry as a whole. It’s just one more way to ensure that our clients, who expect the very best, receive that and so much more! I was getting ready to write yesterday about my wonderful weekend as a groomsman when I was sidetracked by an odd e-mail from someone supposedly seeking a videographer for his daughter’s wedding. The odd syntax and bad grammar almost had me convinced that it was a fraud, but the request for my service was so specific that I left the door slightly open and responded. But when his second e-mail to me proposed his sending me a check for double the package price, then my wiring him the difference, I realized it was a business-specific version of an old scam. I know about all the “Nigerian billionaires” who need my help, but a father of the bride seeking a videographer for a wedding? That could probably fool somebody like me, especially if the scammers brushed up on their grammar a bit! My brother-in-law’s wedding weekend was everything I expected and more! The rehearsal dinner was at Buca Di Beppo’s, the ceremony was at St. Luke’s UMC, and the reception was at the Rathskeller. I could write a whole column about it, but let’s just say that it was the kind of wedding I would have loved to have videotaped. Both the bride and groom are deep, emotional and expressive people, so there were a lot of heartfelt moments and speeches throughout the weekend, and a lot of tears at the altar. It was an honor to stand up and witness those moments up close, and a relief to do so just once without a camera on my shoulder. It was also a kick to be on the other side of the fence, having the church coordinator I’ve worked with so many times pinning a boutenniere on me for a change, or having the photographer I worked with at a bar mitzvah just a month ago photographing me. The best part for me personally was seeing my three boys experience the joy of a wedding day for themselves, knowing that Daddy gets to witness and preserve moments like these every weekend for a living. I was so proud of the job my oldest son Matthew did handing out programs, and dancing with him and his twin brothers all night at the reception at the Rathskellar was one of the highlights of my life. Having videotaped moments like that at over 500 weddings, there was a sense of life coming full circle for me to experience those moments myself, as nothing makes me happier than seeing my children so full of joy. I’m also glad that my multi-talented associate producer and friend Laurie Buschmann just happened to be the DJ’s guest, and was therefore able to help my wife Chris capture those moments on video. I’ll post a few pictures soon, once I figure out this blogging thing a bit more. In the mean time, I’m putting the finishing touches on a wedding I recently shot in Fort Wayne and preparing for that BIG announcement about IndyVisual. Happy planning! I have one fun little job to complete today before I take Friday off to enjoy time with my Milwaukee-based in-laws. Flip Miller brought in some old VHS and Mini-DV tapes for me to convert to DVDs. I first met Flip when we had neighboring booths at a bridal show at the Indiana Roof Ballroom in 1994, back when we were both still doing bridal shows. Since then, I’ve probably worked at more events with his band than any other single wedding vendor. A few of his band members even chuckled recently about how I seem to know – and shoot accordingly – every little nuance of their numerous, tightly arranged medleys. (His guitarist Sandy peeks nervously over his shoulder whenever he starts his “What I Like About You” solo, because he knows Bob’s comin’ to get the shot!) Anyway, it’s been fun to watch Flip’s kids, whom I haven’t seen since I shot a promo at his house over ten years ago, grow up in front of my eyes. These DVDs will be a special Mother’s Day surprise for his wife, who I seriously hope isn’t reading this! Next week I plan to finish editing the last of our spring weddings, update the website with some new clips for the first time in over a month, and cap it all off by making a MAJOR announcement about IndyVisual. (That’s what we call a “teaser!”) So how does one end a blog entry? I suppose with the promise that future entries will be loaded with entertaining and concise info that will give you an extra glimpse into the local wedding scene, our studio, and yours truly. Happy planning!